Take advantage of a risk-free service in Yiewsley that has received over 95% of positive client feedback! Q: What does the window cleaning in Yiewsley involve? 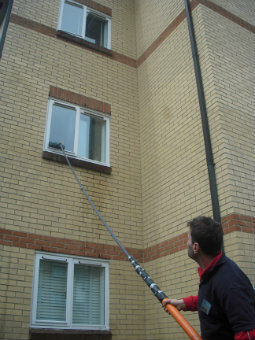 A: Our service will be conducted by experienced and background-checked Yiewsley window cleaners. They'll also don branded uniforms, so you'll easily notice them as soon as they approach your building. A: In essence, this is a lengthy pole that spurts water under powerful water pressure. It allows the experts to reach the fourth floor of any commercial or domestic building from the safety of the ground. Q: Will you link your gear to my building's water source? A: Not at all! The specialists will use a special filtered water container inside their van. However, if the tank is empty, we will gladly welcome your offer. A: You must make sure that there will be a empty parking slot within 30 metres from your domain and on the same side of your windows. The professionals also need to have an effortless access to your property. When you schedule a window cleaning Yiewsley session, you'll be able to refresh the panes of any property at fair prices that remain unaffected by minimum contracts or undisclosed payments. See if you agree with our opinion – check our useful price table below. With window cleaning in Yiewsley, you can quickly remove long-forgotten splodges from any industrial or household property. Continue reading to discover how. To clean your windows' outer side, the experienced window cleaners in Yiewsley will deploy a modern cleaning equipment – a water-fed pole that runs on purified water. The washing tool's notable reach (22 metres) allows the adepts to drive out blemishes from any four-storey premises without using ladders or harmful washing solutions. To tackle stains on lofty buildings, we've come up with a wholly different cleaning procedure – the rope access window washing. After assessing your property's dimensions and location, a team of dependable abseilers will either use ropes or ladders and squeegees to restore the former glory of your windows. We always plan each session beforehand to avoid injuries and can give you all the necessary COSHH documentation upon request. To refresh windows on the inside, the specialists may have to carry sponges and ladders to reach hard-to-get places. We are pleased to report that our window cleaning in Yiewsley has been requested by several neighbouring regions as well. You can learn which districts we operate in below. Another quick and easy way to get a free instant quote or to book window cleaning services Yiewsley UB7 is through our web site.